Tamil is written in a non-Latin script. Tamil text used in this article is transliterated into the Latin script according to the ISO 15919 standard. A milestone which uses both Tamil and Indo-Arabic Numerals (Tanjore Palace Museum). 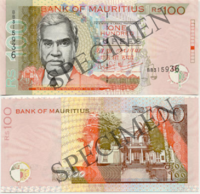 Modern Tamil numerals featured on a 100 Mauritian rupee note. Tamil numerals (Tamil: தமிழ் எண்கள், இலக்கங்கள்), refers to the numeral system of the Tamil language used officially in Tamil Nadu and Singapore, as well as by the other Tamil-speaking populations around the world including Sri Lanka, Malaysia, Mauritius, Réunion, and South Africa, and other emigrant communities around the world. Old Tamil possesses a special numerical character for zero (see Old Tamil numerals below) and it is read as andru (literally, no/nothing). But yet Modern Tamil renounces the use of its native character and uses Arabic, 0. Modern Tamil words for zero include சுழியம் (suzhiyam) or பூச்சியம் (poocciyam). Tamil has a numeric prefix for each number from 1 to 9, which can be added to the words for the powers of ten (ten, hundred, thousand, etc.) to form multiples of them. For instance, the word for fifty, ஐம்பது (aimpathu) is a combination of ஐ (ai, the prefix for five) and பத்து (paththu, which is ten). The prefix for nine changes with respect to the succeeding base 10. தொ+ the unvoiced consonant of the succeeding base 10 forms the prefix for nine. For instance, 90 is தொ+ண் ('ண்' being the unvoiced version of 'ணூ'), hence, தொண்ணூறு). These are typically void in the Tamil language except for some Hindu and Christian religious references, example 'அட்ட இலட்சுமிகள்' (the eight Lakshmis) in a Hindu context, or 'ஏக பாலன்' (One son) in a Christian context. However, it should be noted, that even in religious contexts Tamil language is usually more preferred for its more poetic nature and relatively low incidence of consonant clusters. Unlike other Indian writing systems, Tamil has distinct digits for 10, 100, and 1000. It also has distinct characters for other number-based aspects of day-to-day life. Proposals to encode Tamil fractions and symbols to Unicode were submitted. As of version 12.0, Tamil characters used for fractional values in traditional accounting practices were added to the Unicode Standard. You can transcribe any fraction, by affixing -இல் (-il) after the denominator followed by the numerator. For instance, 1/41 can be said as நாற்பத்து ஒன்றில் ஒன்று (naatpaththu ondr-il ondru). The suffixing of the -இல் (-il) requires you to change the last consonant of the number to its இ (i) form. For example, மூன்று+இல் (moondru+il) becomes மூன்றில் (moondr-il); note the உ (u) has been omitted. Common fractions (பொது பின்னங்கள்) have names already allocated to them, hence, these names are often used rather than the above method. ^ Aṇu was considered as the lowest fraction by ancient Tamils as size of smallest physical object (similar to an atom). Later, this term went to Sanskrit to refer directly to atoms. Decimal point is called புள்ளி (pulli) in Tamil. For example, 1.1 would be read as ஒன்று புள்ளி ஒன்று (ondru pulli ondru). Percentage is known as விழுக்காடு (vil̠ukkādu) in Tamil or சதவீதம் (sathavītham). These words are simply added after a number to form percentages. For instance, four percent is நான்கு சதவீதம் (nāngu sathavītham) or நான்கு விழுக்காடு (nāngu vil̠ukkādu). Percentage symbol (%) is also recognised and used. Ordinal numbers are formed by adding the suffix -ஆம் (aam) after the number, except for 'First'. As always, when blending two words into one, an unvoiced form of the consonant as the one that the second starts with, is placed in between to blend. This song is a list of each number with a concept its primarily associated with. As the antique classical language of the Dravidian languages, Tamil numerals influenced and shaped the numerals of the others in the family. The following table compares the main Dravidian languages. Also, Tamil through the Pallava script which itself through the Kawi script, Khmer script and other South-east Asian scripts has shaped the numeral grapheme of most South-east Asian languages. ௳ is also known as the Pillaiyar Suzhi; lit. 'Curl of Pillaiyar' is a symbol that most Tamil Hindus will start off any auspicious document with; it is written to invoke the God Pillaiyar, known otherwise as Ganesha, who is the remover of obstacles. The Tamil numbers used symbols. ^ N. Subrahmanian (1996). Śaṅgam polity: the administration and social life of the Śaṅgam Tamils (3 ed.). Ennes Publications. pp. 235, 416. Retrieved 2 December 2015. ^ Literary theories in Tamil: with special reference to Tolka:ppiyam. Pondicherry Institute of Linguistics and Culture. 1997. p. 135.